It’s the first, strictly digital single I’ve released and I’m really proud of how it turned out. It’s called Frankie and it is the story of a sarcastic, talking cat named Frankie. It is based on a true story. And even though I say that before each time I play it live, people don’t believe me. But it’s true, it’s based on a true story. My good friend, and fellow puppeteer, Alison Mork has a pet cat named Frankie. Yes, that’s Frankie picture as the album art for the single (photo courtesy of Alison Mork at the Frankie Archives). Alison and I talk on the phone regularly and she’ll often update me on something cute that Frankie has done since the last time we spoke. And the idea for the song was born. I wrote it rather quickly, took me just about a day, sitting at my computer figuring out the lyrics. It was the first song I’ve written on mandolin, a departure from all my other songs which were written on guitar. I’ve super happy with how the final song turned out. Steve Goodie did an amazing job on the instrumentation on the track. It’s everything a bluegrass fan (me) could hope for. I do wish my vocals were a little better but I’m never happy with how I sound, so that’ll never happen. Another interesting tidbit about Frankie. A lot of the time authors base characters in their books on real people. Some even write real people into their books. I’ve sort of done that with this song. Of course, Frankie is based on a real cat, but whenever I sing the song I always picture the reporter as being my good friend, author, Mur Lafferty and as far as I’m concerned, that’s who the reporter is! So Mur has a cameo in my song. Anyway, that’s a little of the backstory on my new song Frankie. I hope you get a chance to check it out. 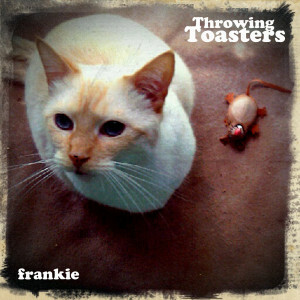 I’ve also sent the track to Dr. Demento, so if you have a moment, CLICK HERE and request Frankie by Throwing Toasters on The Dr. Demento Show. Please, just one request per week. 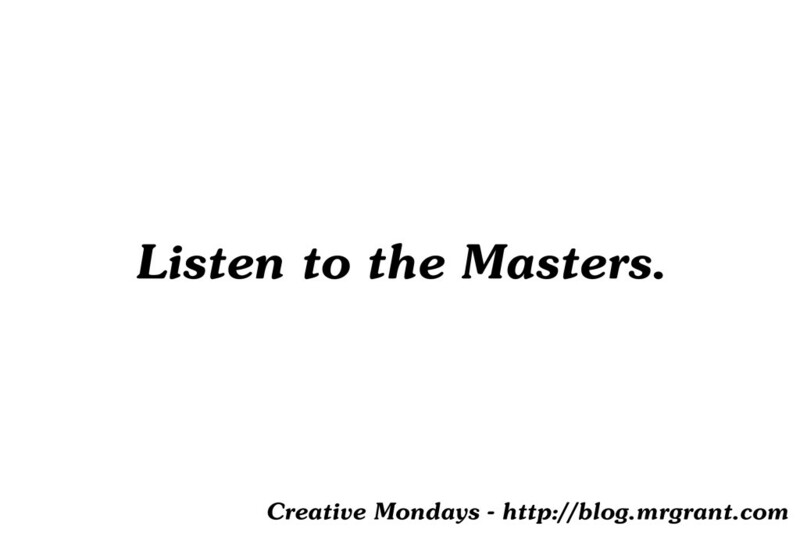 Creative Mondays #012 – Listen to the Masters. A phrase I’m sure you’ve heard a before is ‘Listen to the Masters.’ Meaning seek out the people who are considered the pinnacles of your chosen field(s) of art and study them. In painting it’s van Gogh, Picasso, Dali and more. In music it’s Beethoven, Mozart or The Beatles if you’re more contemporary. Writing has Hemmingway, Shakespeare, Rowling or King. Screenwriting has Stanley Kubrick, Billy Wilder and Ingmar Bergman to name a few. Acting has Tom Hanks, Meryl Streep, George Clooney. Just Google “Most famous (you shosen field of creative art) and you’ll get list after list. Of course, these lists are all subjective, but you’ll find the top three are usually people everybody knows. These are the Masters. I think you should listen to YOUR masters. I think you should study to the people who inspired you to get up off your rear and start creating. The people who you feel are the pinnacle of your chosen field(s) of creation. The people who inspired you are your Masters and you should study them totally and unapologetically. If someone who inspired you was Hemmingway or Mozart, great. But if who inspired you is or was not a household name, study them. Learn from them. I’ve said on here time and time again that one of my inspirations is Joel Hodgson, creator of Mystery Science Theatre 3000. As popular as Joel is, when I say his name to people I sometimes get the ‘huh?’ look. When I explain he’s the creator of Mystery Science Theatre 3000, that clears it up for some, but there are still people out there who haven’t heard of that show. And that’s fine. The people you look up to don’t have to be household names. They just have to light a creative fire under you that spurs you on to emulate them. They inspire you to continue creating the art they have shown you. I just finished the book Steal Like An Artist by Austin Kleon. It’s a great read that I recommend any create person pick up. It’s short and if you have an hour or so, you can probably zoom right through it. In one chapter he talks about creating a family tree for your creative self. This family tree isn’t about blood relations though, it’s about the people who inspired you creatively and made you the creative person you are today. Austin tells you to study the people who directly influenced you and then study the people who influenced them, creating a family tree of creativity. “Weird Al” Yankovic is a big influence on my comedy, obviously. When I first heard Al’s Eat It, I was hooked. After I’d picked up his album, I noticed that he thanked Dr. Demento on his discs. I, somehow because this was before the internet, found out that Dr. Demento hosted a weekly radio show. I cajoled my parents into recording the show for me every week and it opened a whole new world up to me. Suddenly I was hearing Al’s influences. Allan Sherman, Stan Freberg, Tom Lehrer and Spike Jones. I was creating a creative family tree for my love of comedy music. I was listening to new things that would become true favorites (Stan Freberg, Smothers Brothers) and some that, though I could see the appeal, were not favorites (Frank Zappa). This was all because I followed the creative line from “Weird Al” back. I think that listening to your Masters, is super important and should be done by every artist. You don’t know where you can go if you don’t look back and see where you have been. Who has inspired your creative life? Have you researched them and seen who influenced their creative life? Let me know in the comments below.